Two of my friends, both named john, came out with me tonight. I forgot the card to my camera so I will have to post some Iphone pics John took later. We anchored up on the shoal around 5.30. It was perfectly flat and very pleasant. The tide was going out which really confused me because I had thought it was coming in last night. Apparently it was the wind that made it appear the tide was coming in last night. Anyway, we spent the first hour trying everything in the box with nary a swirl. Finally around 6:30 the wind picked up and the tide changed and we had our first blowup and a small 18 in the boat. We all started using plugs and the blowups began. We ended the night with at least 4 each but had many more spectacular blowups that missed. 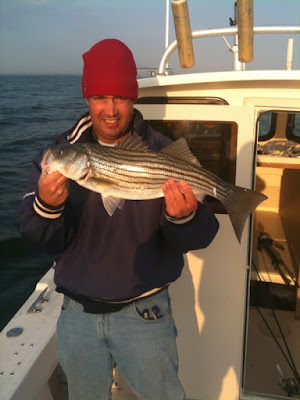 John A. picked up the biggest of the night in a 28 inch class fish.